Armar Ramirez graduated from Far Eastern University with a Bachelor of Science in Fine Arts degree, major in Advertising. A native of City of San Pedro, Laguna who is a multi-awarded retired art director and winner of several national painting competitions. Armar has a 30-year advertising experience in his belt specializing on print ad layouts, storyboards, designs, merchandising, and collateral materials. 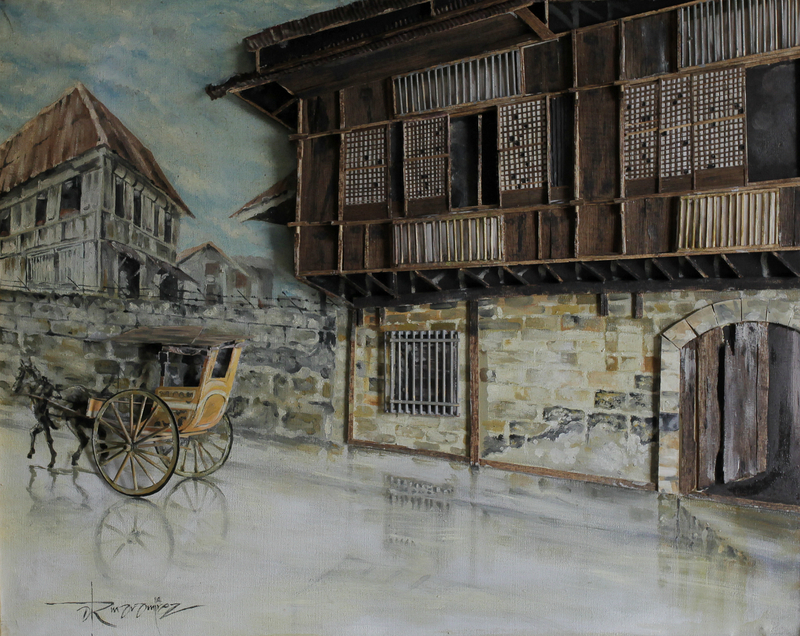 At Present, Armar Ramirez works as a freelance visual artist whose specialty is on portraits and designing. Armar’s preferred style in painting is semi-abstract cubism, 3D mixed media on canvas and semi surrealism. Armar Ramirez sometimes fiddles in semi-abstraction cubism where the image still has one foot in depictive art. He uses a type of stylization where the artist selects, develops and refines specific visual elements such as line, color and shape in order to create a poetic refurbishment or streamlined essence of the original subject. Armar Ramirez paintings are not traditional realistic portrayal of an object from a single view point of view. His abstraction are often superimposed with various planes and facets of themes, a small plate-shaped area, bounded by straight or curved lines, typically laid out in overlapping layers. His conceptual work which in most instances also satisfies the viewer as a three-dimensional design that are constant, often witty, allusions to the everyday world. Armar Ramirez point of view as an artist can be described as semi-surrealism who aims to create experiences that provoke self-awareness. And question the identity of places and the human relationship to the environment by manipulating the relationship of scale, volume, weight, and mass between people, and space. In 2015, Armar’s was a finalist in 2015 GSIS/AAP Annual Art Competition: Balanced Sphere. He was a Juror’s Choice and Honorary Mention: ‘Di lang Tuwing Pasko ang Tradisyong Pilipino at Alveo/Kunst National Open Art Competition. And was a finalist for the theme-Unborn….Never Again 2015 AAP/NCCA Open National Art Competition. He is also an affiliate veteran member of an art group, “Styles, Strokes, Sketches and Society.” 4S is a group of artists who aims to promote creativity in the global art community. By sharing their works in order to learn from each other, inspire and be inspired by others, build networks and encourage healthy competition among fellow artists in the spirit of fun and camaraderie.